The native and adapted plant palette has made a large improvement to the environmental cost/benefits ratio of using plants for ornamental horticulture. The prime driver has been water savings, a subject that many people can relate to, including people who are not focused on other environmental issues or who may be primarily looking to save money and reduce maintenance. The gardening approach using this palette is flexible and can even approach fine gardening standards while using far less resources. The focus of designs using these plants is usually still discrete monocultures, or ‘drifts,’ of single species of plants using unity and contrast techniques derived from traditional principles. There has been a trend in recent years towards more naturalistic intermingled plant combinations using this palette as well. It has been very well promoted by government, industry, the design community, and academia, thereby hastening the adoption of this important innovation. Plants that were very hard to find and very expensive a few years ago can now be found at very low prices in many big box retailers. The native and adapted plant palette is currently the state of the art when it comes to a proven and commercially-viable environmentally friendly strategy for selecting plants. It is the one that the most forward thinking landscape architects and garden designers use. Some of the tenets have even been written into landscape ordinances in drier parts of the United States. It is flexible, cost effective, and there is ample information easily available to train designers for success. Figure 1 above shows a proposed design for a subdivision in North Texas that used this approach. The design plays off of the Butterfly logo of the subdivision, has plants designed to attract butterflies, and is evocative of the shape of a butterfly wing. The blue plant Conoclinium coelestinum (Blue Mist Flower) is the only plant in the design that is actually native to North Texas. It blooms in the fall when hungry Monarch Butterflies are slowly migrating south through the area. Other adapted plants used include Zexmenia (Wedelia hispida), Autumn Sage (Salvia Greggii), Dwarf Yaupon Holly (Ilex vomitoria nana), and Iris sp. I designed this garden in 2012 and have been using this approach in both professional work and teaching since 1995. 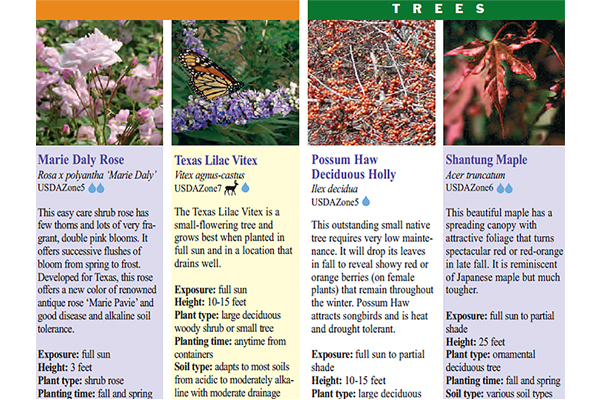 As the example above shows, Texas SmartScape™ and other similar plant palettes of adapted plants are not very useful, though, if native plants and local ecology are a consideration. Searching the SmartScape™ database for the same drought and shade tolerant palette as was done with the Monrovia search in Part 3 of this series yielded only four native plants (versus none on the Monrovia site). One of them (Violets) was listed as Viola sp. which would almost certainly point a purchaser to an exotic hybrid such as Viola odorata since the native species, Viola missouriensis, is difficult to find for sale in North Texas. In January 2015, the overall SmartScape™ plant list had 115 species listed as native and 122 listed as exotic. Of the 115 native species listed, at least 30 are not native to the area that is the target of the SmartScape™ program—North Texas. This is a big improvement over the national corporate plant palette but still leaves a long way to go to get into balance from the standpoint of local ecology. Additionally, with 2/3 of the well adapted species not native to the region, there is a much greater chance of accidentally introducing invasive exotic species. Readers of this post are encouraged to check their local sources of native and adapted plants for indigenous species by consulting BONAP, the Biota of North America Project. At BONAP, you can see an up-to-date, nationwide, county-by-county GIS of over 24,000 plant species growing in unmanaged areas that have been found and documented by reputable botanists. The plants are classified in maps produced by database queries as native, adventive, exotic, and more. One of the most useful ways to use BONAP is to see where the location of your planting design is relative to the nationwide distribution of a plant. For example, in my area, if a plant is native from North Texas East, as in figure 2, it will probably be a lowland plant in North Texas because of a 1” increase in yearly rainfall for every 10 to 15 mile move to the east. If it is native from North Texas West, it is most likely more drought tolerant and will be more useful as an upland plant in North Texas. Similar correlations can be made with North/South distributions and cold hardiness. I am always pleased to find an attractive and useful plant that is endemic to one or two states in our part of the world. These plants offer unique opportunities to contribute to the regional character of a design and to impact the local ecology with a plant that is probably not typically grown by the national horticulture industry and may even be endangered. The most heavily promoted university-based program in Texas that develops adapted plants for the horticulture industry is called the ‘Texas Superstar®’ program, which has been developed and promoted in cooperation with Texas A&M University. The Texas Superstar brochure lists plants for the entire state with little regard for the nativity or regional ecological appropriateness of plants for specific biomes. Of the 41 plants that are promoted to both the horticulture industry and to designers and homeowners, only seven are native somewhere in the state of Texas. Interestingly and confusingly, one of the plants is called ‘Texas Lilac Vitex’ although the plant is in actuality a native of the Mediterranean region and Asia (Vitex agnus-castus). Figure 3 shows a sampling of plants from the ‘Texas Superstar’ list with three exotic and one Texas native (Ilex decidua). 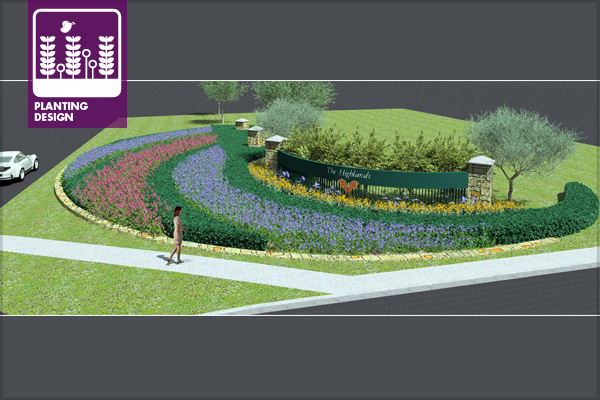 The SmartScape™, Texas Superstar®, and other similar programs throughout the United States provide an expectation of aesthetics that is almost impossible to reproduce using a palette of native plants. It is a similar ornamental display ethos as the one featured at Butchart Gardens and the Dallas Arboretum from Part 2 of this series, but with plants that use fewer resources, especially water. The unique regional character of plants is not fully taken advantage of with a reconceptualization of the approach to planting design that better accounts for what native plants have to offer through the seasons. This character may not be as conspicuously or as consistently floriferous and controllable as using a palette of hybridized and exotic plants from around the world. Taking advantage of the seasonal attributes of native flora is a prime benefit of using a diverse palette of aesthetically qualified native urban polycultures. The native plants bring a more subtle beauty to the landscape that is tied to the climate, soil, and biota as well as the unique aesthetics of the region. Figure 4 illustrates the balance of the native and adapted plant palette as explained in Part 1 of this series. It shows that it provides very good aesthetics, environmental considerations have improved, and ecology has also improved. However, the fundamental approach to planting design for most designers and the growing, but still limited, use of native plants keeps the ecological portion from moving into better equilibrium. Next month’s post will continue this discussion with a case study of the George W. Bush Presidential Center in the Dallas area. The design, by Michael Van Valkenburgh and Associates, used a variety of approaches that are instructive as potential next steps in the move towards a future viable plant palette with a balance of aesthetics, environment, and ecology. 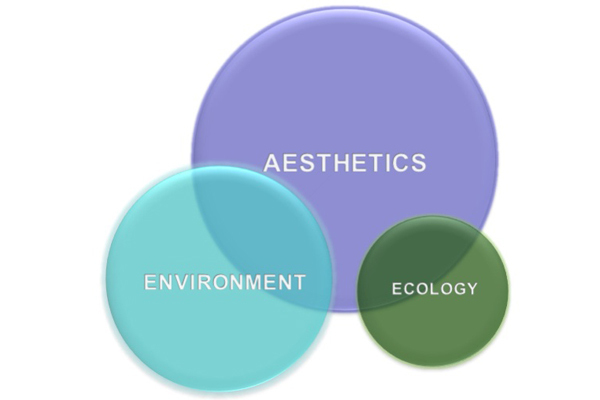 Part 5 will discuss the first two of these approaches: 1) using regional consultants to refine a plant palette for a design distant from the home base of the landscape architect; 2) a full blown prairie restoration palette and some of the issues this approach raises for its use in urban areas. Part 6 will begin the discussion of aesthetically qualified native urban polyculture by presenting an example used at the Bush Center. Denver Water Board. Xeriscape Resources. Texas Department of Agriculture. Texas Superstar®. David Hopman, ASLA, PLA, is an Associate Professor of Landscape Architecture at The University of Texas at Arlington, a registered landscape architect, and a research associate at The Botanical Research Institute of Texas (BRIT).